I love dark chocolate. Apparently people at my husband’s workplace do, too. At least, that seems to be the only thing explaining the two separate requests I got for Chocolate, Chocolate Chip Scones. So, I started thinking about why I avoid them, and came up with the fact that they always seem to be far too dry and dense. I blame it on the unsweetened chocolate powder and the regular flour. So in making up this recipe, I opted for a mix of lighter cake flour (to be found in the baking aisle next to regular flour) and regular all-purpose flour. The results, I must say, surprised me. In a medium sized bowl, whisk gently together the heavy cream, 1% milk, vanilla bean paste and instant coffee. Set aside. 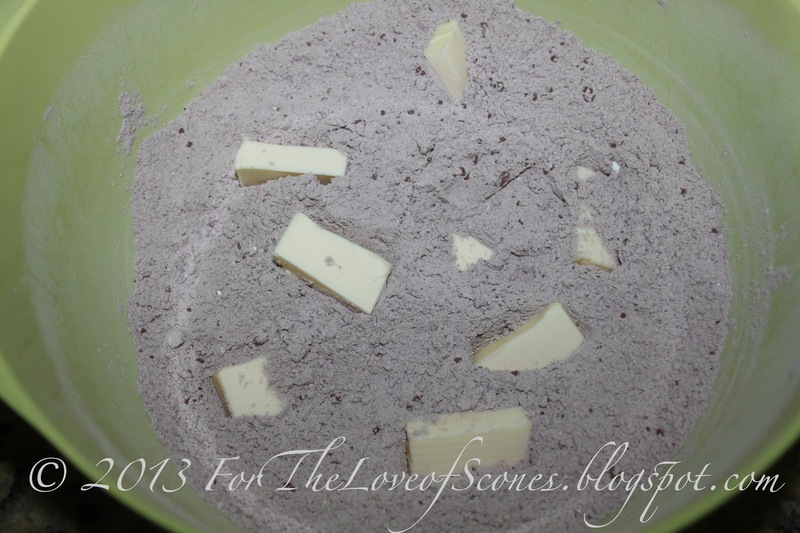 In a large bowl, whisk together cake flour, all purpose flour, baking powder, salt, chocolate powder, and brown sugar. Add the diced butter and work into dry ingredients with a pastry blender, two knives, or your fingertips until the mixture resembles coarse sand. 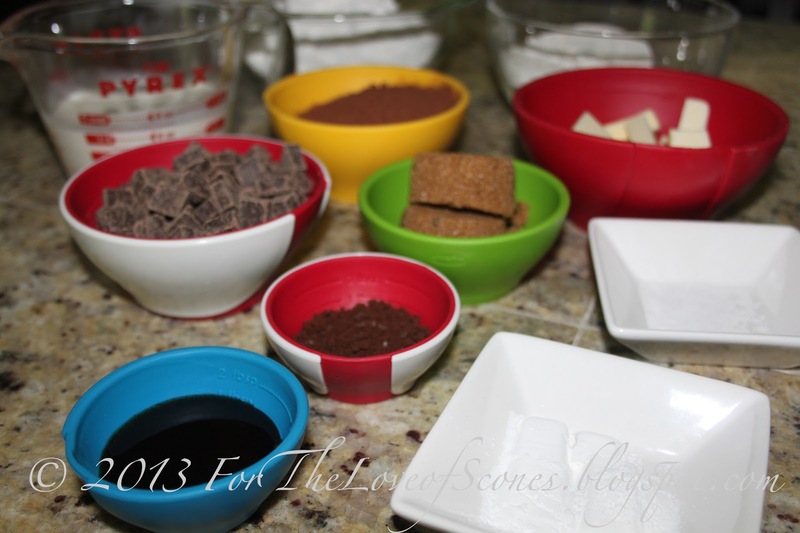 Add 3/4 cups dark chocolate chunks and mix. Pour the liquid over the dry ingredients and combine until just mixed. Do not over knead. 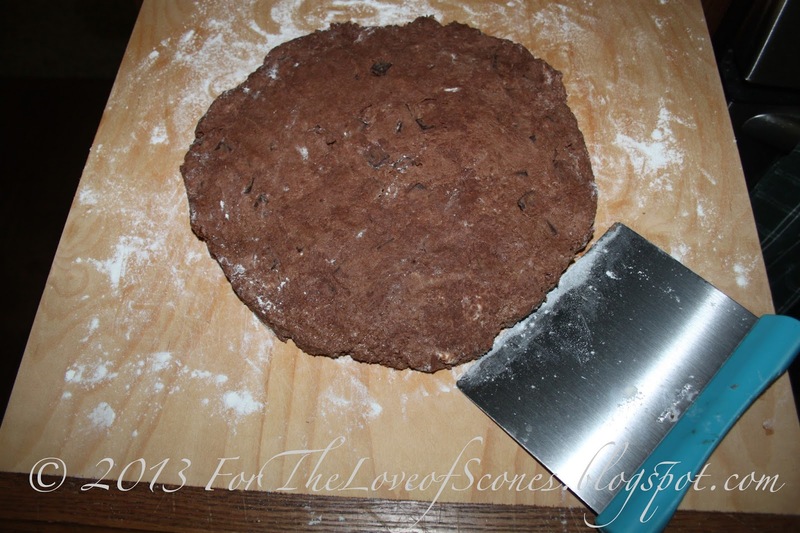 Turn out onto a lightly floured countertop and divide dough into two even pieces. Flatten each piece into a round about 1/2-inch high. Cut each round into 8 triangles. Place the scones on a parchment-lined baking sheet and bake at 400ºF for about 13 minutes or until browned on top (you will have to look at the edges to see the color change). *these are rich, so they are best served in small amounts. Everything’s measured out and ready to go. 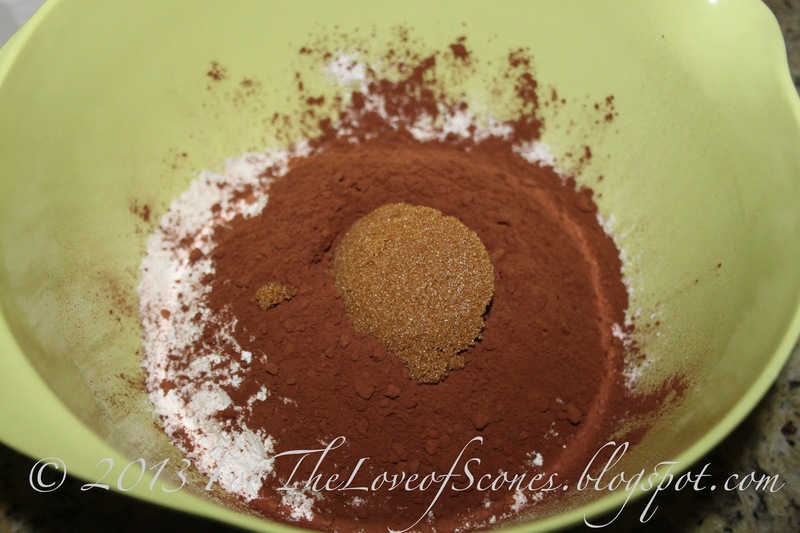 Combine the liquid ingredients now so that the instant coffee can dissolve. 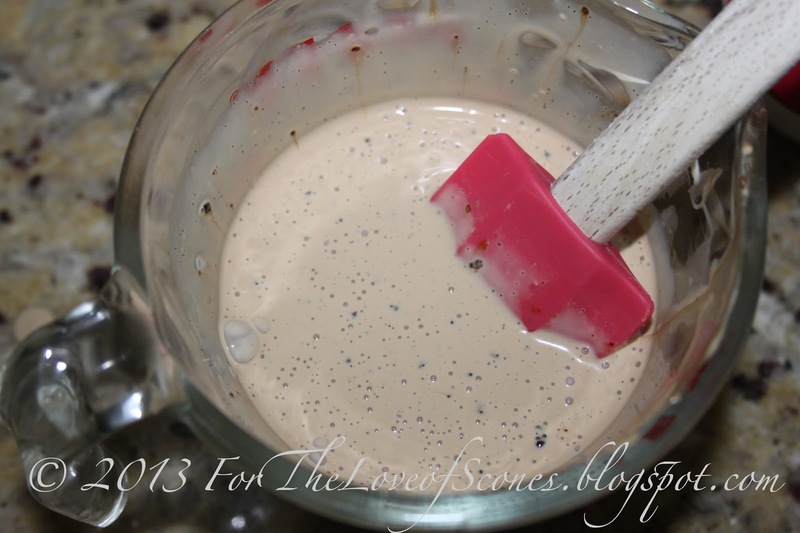 Mix should look like coarse sand–a few butter lumps are okay. 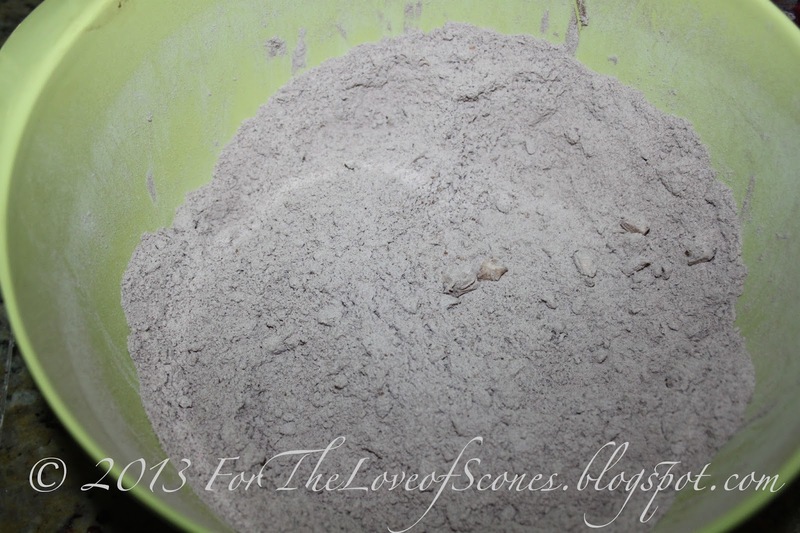 press out onto a lightly floured countertop to a 9-inch round. so that you can cut small scones. 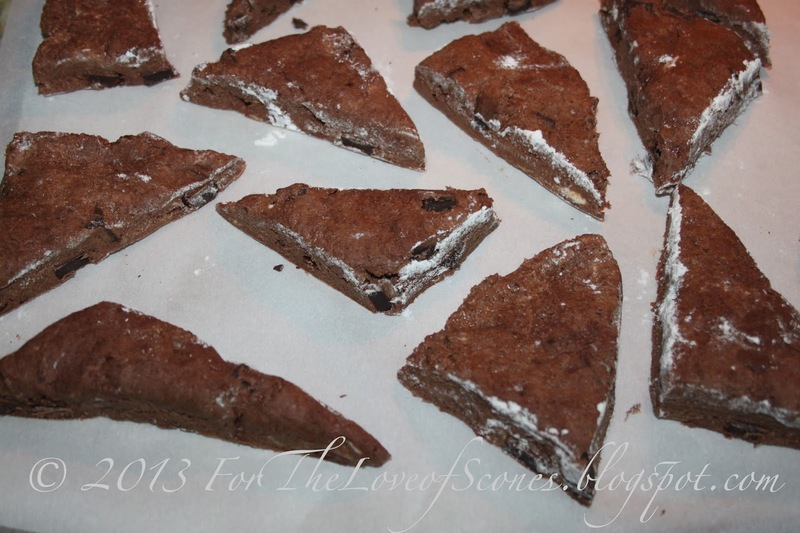 Or cut the two smaller rounds into 8 pieces each for more regular sized scones. The finished product: a quite irregular, but decadently tasting scone. These tasted like truffles. They are excellent with either a tall glass of milk or a mug of hot coffee. 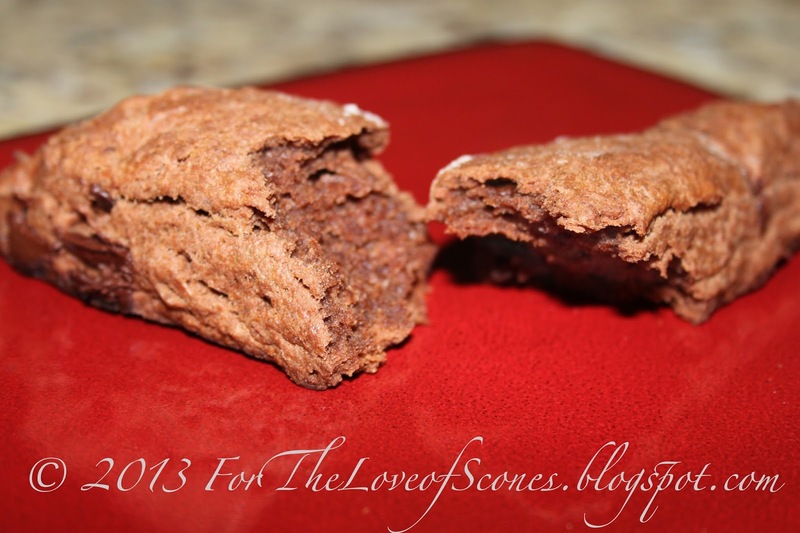 Great as dessert or a decadent breakfast, and wonderful for the chocolate lover in your life.